The bridle is from Sidney Nolan’s series, For the term of his natural life, which comprises a total of 31 crayon-pastel drawings on paper. The series was inspired by Marcus Clarke’s epic novel that vividly relates the hardships of convict life in early Australia. This particular image recounts the story of a convict who, in Clarke’s book, spoke out of turn and who was subsequently punished by soldiers. The work derives its title from the cage-like contraption used for torture that was placed over the victim’s head and it included a spiked metal bridle-bit that was inserted into their mouth. It was used to inflict pain and publicly humiliate the victim who was effectively prevented from speaking. In this drawing the convict is shown with the bridle over his head, gagged and strapped to a triangular structure used for floggings. His back bears the marks of a whip, and his legs, which are depicted in anatomical detail, appear to hover above the ground. The convict’s fate is clear, signified by the skeleton in the background, presumably another tortured or escaped convict. …an article of harness, that at first sight creates surprise in the mind of the beholder, who considers what animal of the brute creation exists of so diminutive a size as to admit of its use, On inquiry, it will be found to be a bridle, perfect in headband, throat-lash etc., for a human being. 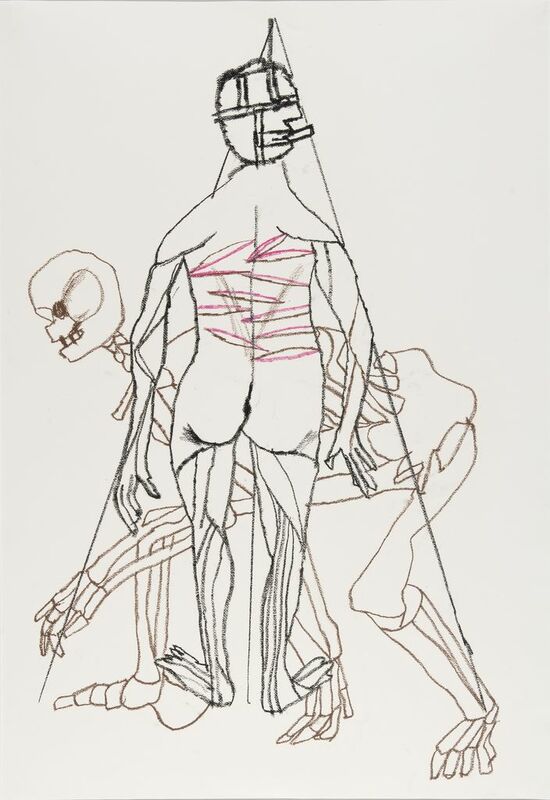 Sidney Nolan, 28 Aug. 78, cited in John Buckley, Sidney Nolan: For the term of his natural life – 31 drawings, Department of Capital Territory, Canberra, March 1981 (back cover).